The Mandé art of jeliya carries a long and complex tradition of fine distinctions and endless debates about the qualities that earn its hereditary poets, musicians, and soothsayers the highest accolades and honorifics. But on the subject of the great jelimusolu (female singers) of our time, there is near-unanimity regarding Kandia Kouyaté: she is a ngara, perhaps the only one of her generation. More than a skilled singer, a ngara is an extraordinary artist who possesses what many would say is a paranormal aura of majesty. Born and raised in Kita, an ancient city in southwestern Mali that has bred many important musicians, Kandia began performing professionally in Bamako while still a teenager, and quickly became quite successful; she saw no reason to make records. But among her most ardent fans was record producer Ibrahima Sylla, who implored her to give him the opportunity to make an album with her. She resisted, he persisted, and nine years later Kita Kan (Sterns, 1999) was released to international acclaim; the beautiful Biriko (Sterns, 2002) followed. In 2004 Kandia Kouyaté suffered a stroke. Her recovery was slow and difficult, and for seven years she hardly spoke and did not sing at all. Even after regaining her strength she considered herself retired. By that time Ibrahima Sylla was in failing health, but he had not lost his ardor for her voice or his awe of her aura, and in 2011 he visited her home in Bamako and convinced her to return to the recording studio. Sadly, he did not live to complete the album. 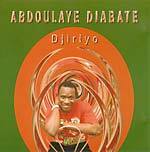 He died in 2013, and François Bréant, who had worked with him on such recording landmarks as Salif Keïta's Soro (Sterns, 1987) and Thione Seck's Orientation (STCD 1100CD, 2005), finished the project. 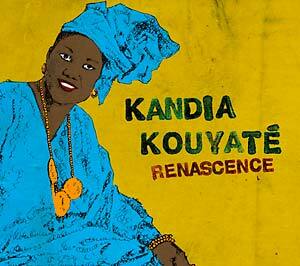 "This new album was made only because of Sylla," says Kandia. "I had been ill and Sylla was gravely ill, but he was always there [in the studio], encouraging me. He asked me to sing everything I knew, everything that that was in my head. I said 'I know nothing. I've forgotten everything.' But he insisted. 'Tomorrow it will come back,' he said." And it did. Her voice, darker and richer than when it first carried her to fame decades ago, has an authority that arises from a very deep well and cannot be faked. 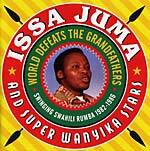 It is the voice of a true ngara. Renascence is her resounding declaration of personal and artistic rebirth.